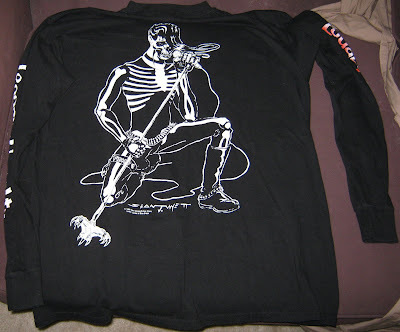 It seems like I just can't stop buying any shirts Glenn Danzig related these days. I've even moved into the really rare, expensive, and hard to find shirts, which I'll be posting at a later date. Until then, I wanted to talk about this weird shirt that must have gotten reproduced a million times back in the 90s. 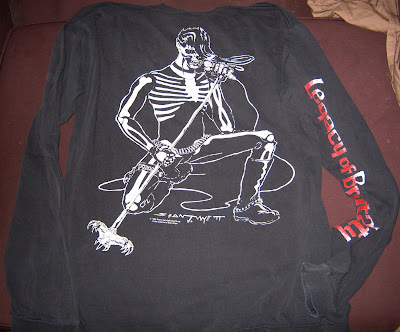 That shirt is the Legacy of Brutality long sleeve. Incredibly I have 3 versions of this shirt. The first version I posted back in June. 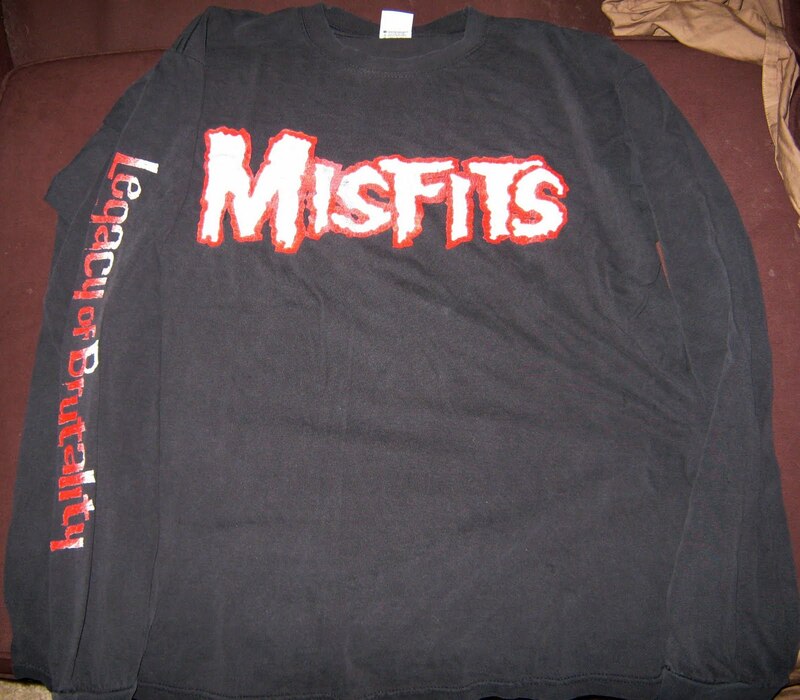 This was printed in 1995 and done by Misfits/Samhain. Strange right? But that's what the copyright info says on the shirt. I'm not quite sure why there was a licensing agreement with Samhain. Maybe because LOB came out in 1985, and Glenn was doing Samhain at that point, the actually LOB logo had a money connection to Samhain, but I really don't know. 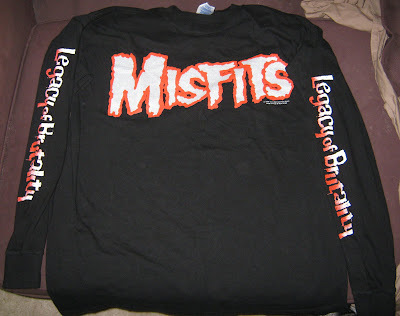 After that version in 1995, I only know about 2 other LOB long sleeves. These versions were licensed to Blue Grape and printed in 1999. Let's look at the one that I got about a month ago. Now if you look at this front pic the first thing you notice, besides the fact that this thing is completed toasted, is the misfits logo, and Legacy of Brutality on the sleeve. But no copyright info. If you look at the pictures from my post back in june you saw that this shirt had a completely different front and no sleeve print. Plus the copyright info was on the front. OK so let's look at the back of the toasted LS. Different back as well from the 95 version. They used the giant singing skeleton on this one. This is also where they included the copyright info. There's one other important bit of info to make note of. This was printed on an Anvil shirt. Now let's check out this other version I picked up about a week or so ago. Right off the bat you can see that this one is definitely not toasted. In fact it's in incredible shape. The print is bright, there's no cracking, and the black of the shirt is still really thick. What else you notice right away is there's 2 sleeve prints. And they're the same...huh? Exactly, HUH?! I don't remember the last shirt I saw that had the same sleeve print on both sleeves. Totally strange. Another interesting thing is the Misfits logo is actually a little bit bigger on this one, than the other one. And the last thing that's fairly obvious is the copyright info is on the front. Now for the back, which is exactly the same. Even down to the fact that there's a second copyright info print! Weird again. Now the last difference between these 2 shirts is the manufacturer. This one was done by M & O Knits. Now I don't know if the reason Blue Grape switched was because of price or quality or what. But I do know that the M & O one held up and the Anvil one spit the bit. Granted I have no clue how these 2 shirts were stored or worn over the years. But they switched and I'd love to know why. 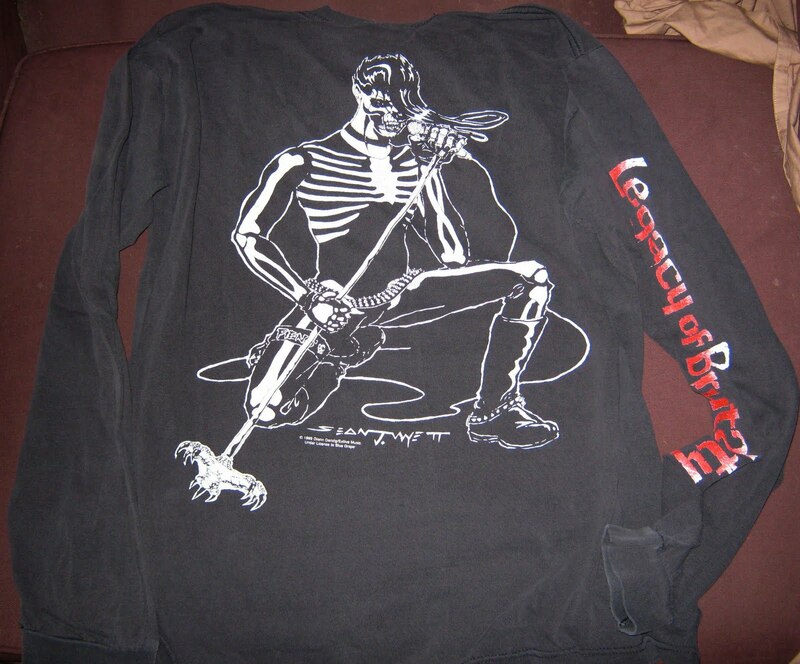 I'd also love to know if anyone has a long sleeve with the same sleeve print on both sleeve. Makes no sense.